Will This Stock Dominate One of 2019’s Hottest Sectors? Every year in the stock market, there are several hot sectors that experience extreme momentum. Within these sectors, there are stocks that will see huge gains, often within very short time periods. In retrospect, it’s easy to see the arc of these stocks. Usually there’s a catalyst that causes the stocks to in essence go viral, attracting a huge wave of buyers like a modern-day gold rush. Past examples of hot sectors include cryptocurrencies and AI (artificial intelligence). Late last year the hot sector was weed stocks. But in 2019, CBD stocks have been dominating the market. Last week, I introduced the concept of hot sectors and explained the basics of how swing traders can take advantage of this phenomenon. This week, I’ll build upon those basic concepts while offering more insight on what to expect from the current hot sector of CBD stocks. CBD is related to pot, but it’s a whole lot more wholesome. CBD, which is short for cannabidiol, is derived from the marijuana plant. However, unlike THC, the psychoactive compound that causes the feeling groovy “high” sensation, CBD is non-psychoactive. While it won’t get you high, believers say CBD has powerful healing qualities. It’s been touted as a cure-all for everything from stress and depression to a reduction in cancer-related symptoms. But if it’s so great and it won’t make you high, then why is it so hard to find? As it turns out, that’s about to change. Every few years, a new Farm Bill is proposed to Congress. This bill is designed to help maintain a sufficient food supply and maintain/protect natural resources by maintaining fair food prices for farmers and consumers. The most recent Farm Bill included a proposal to legalize industrial hemp, which just so happens to be the most common source of CBD. The Farm Bill recently passed, which means that CBD will be getting a lot more exposure and will be much more readily available. Until recently, CBD occupied a legal grey area that kept it mostly contained to individual retailers and mom and pop type health food stores. Now that growing hemp has been legalized, it likely won’t take long for CBD to gain a much bigger audience in mass retailer outlets. Now that the Farm Bill has passed, there’s a lot of interest in CBD. It’s like the industry has gotten the green light for production, and everyone wants in on the action. Not only are big retailers like CVS or Target gearing up to potentially include CBD products among their offerings, but massive companies like Coca-Cola are said to be considering adding CBD-infused products to their offerings. Could CBD be the next multibillion-dollar industry? Many are forecasting that the CBD industry is going to explode, potentially even surpassing marijuana sales. Let’s bring it all together by discussing a good example of a CBD stock to watch. Last week, I wrote about how it’s important to identify sector leaders because they can give you insight about the potential direction of the trend. In terms of CBD products, Boulder-based Charlotte’s Web Holdings (CWBHF on the OTCBB) could be such a sector leader to watch. The company is named for its primary strain of CBD, which takes its inspiration from both a classic children’s book and from a real little girl named Charlotte. Charlotte’s Web entered the public eye in 2013 when they were featured in the documentary “Weed.” The film documents the story of young Charlotte, who suffered from seizures until taking CBD oil. While this brought interest to the company, its products have had a limited reach due to government regulations. In spite of these limitations, they’ve been growing. Even before the Farm Bill was passed, Charlotte’s Web reported revenue growth of over 50%. They have all sorts of CBD products in place, ranging from vape pens to candy to creams and even pet products. Now, with the ability for a greater reach in the market, they have an eye on expansion. Since they already have a successful production model in place, for them it’s a matter of scaling up rather than starting from scratch. This could give them an advantage that has them leading the pack of CBD stocks in the coming months. I’m Paul Scolardi, and I’ve made a career of swing trading hot sector stocks. The key to my success? Identifying momentum before it happens. How do I do it? Through a system I’ve designed of identifying earnings winners, hot IPOs, and sector leaders to figure out what the trends are and where they’re going. Sound intriguing? If so, consider joining my SwingTrades program. In the program, I’ll guide you through my system so that you can grasp the basic tenets of how to find the stocks that are most likely to become the biggest gainers in the near future. 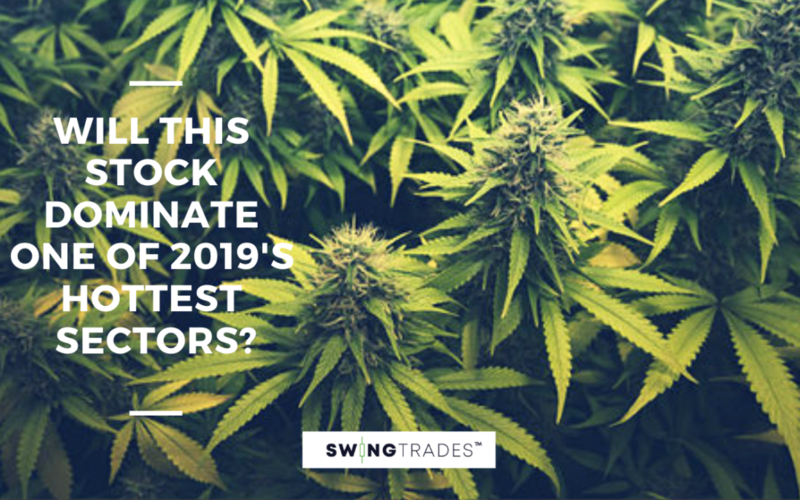 Have you traded CBD stocks? What’s been your experience? Share your comments and let me know.